Lately I’ve been getting a lot of inspiration from three Italian food blogging ladies that I follow. Even though I like to experiment with different cuisines and techniques, Italian home cooking always stays closest to my heart. 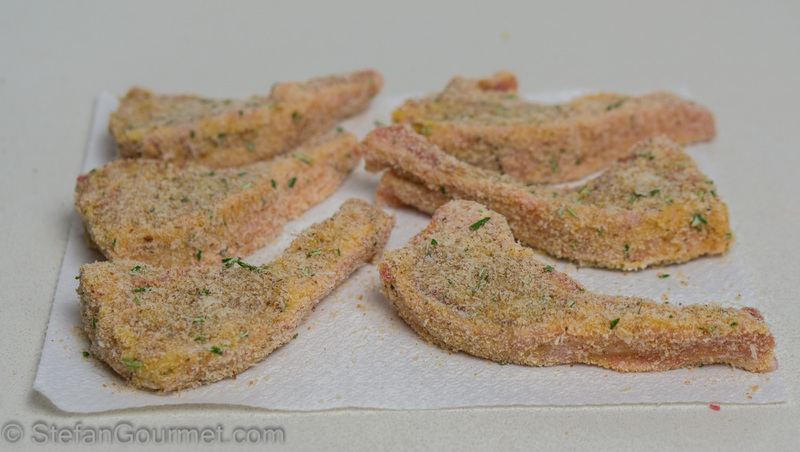 In this case it was Marina who shared her recipe for breaded lamb chops, which she always prepares for Easter. 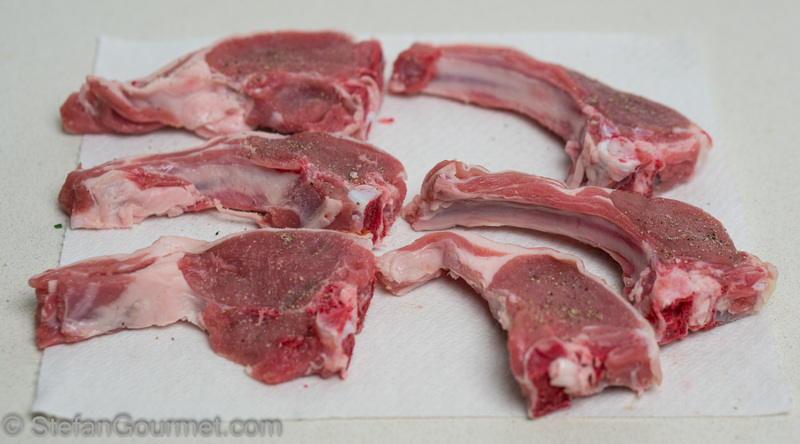 It had never occurred to me to bread lamb chops, but it is delicious. 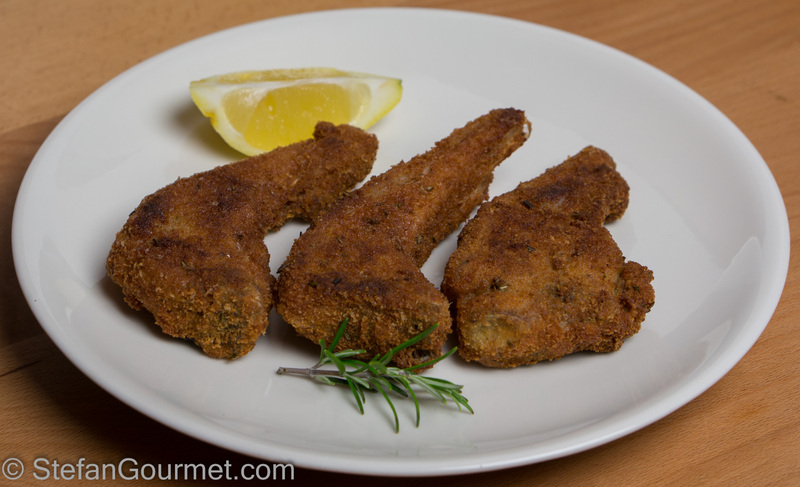 Marina’s version is even more basic than mine: lamb chops are simply breaded with breadcrumbs and fried. With good lamb, that is perfect. I was feeling like something slightly more elaborate, and decided to include rosemary and pecorino cheese in the breading. They turned out delicious. If you prefer the original, simply leave out the rosemary and pecorino. 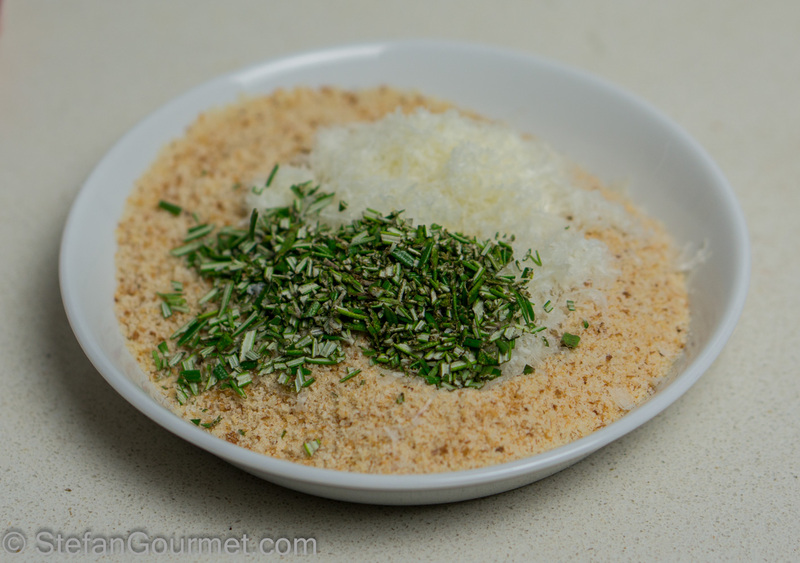 Combine the breadcrumbs, rosemary, and pecorino on a plate and stir to mix. Season the lamb chops with salt and freshly ground black pepper on both sides. Set up an assembly line. 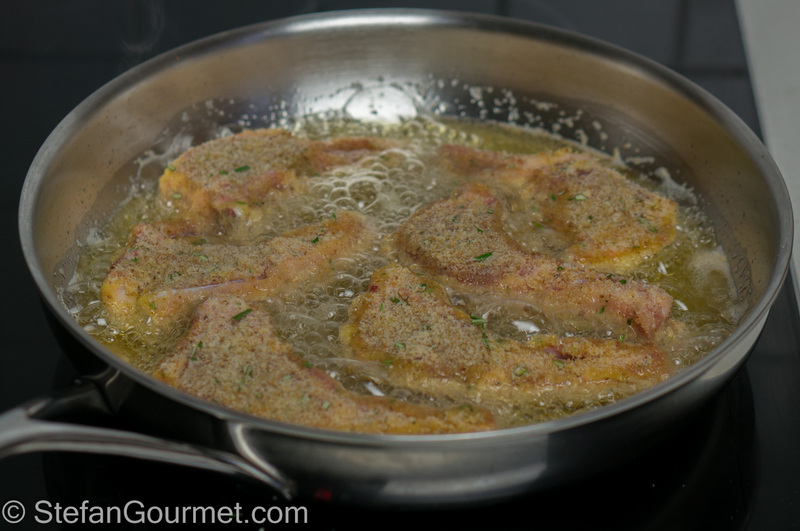 First coat eats lamb cutlet in flour on all sides, shaking off the excess. Then coat it in the beaten egg, again allowing any excess to drip away. Then cover it in the breadcrumb mixture on all sides, pushing to make sure it sticks everywhere. Repeat until you have breaded all of the lamb chops. Allow them to dry for a couple of minutes, then turn them over so the other side can dry too. Heat a generous amount of vegetable oil in a frying pan. 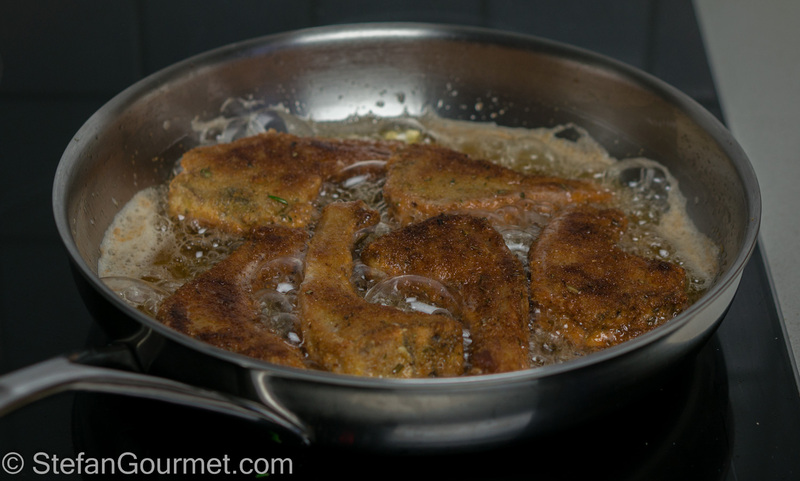 When the oil is hot (180ºC/350ºF), put the lamb chops in the hot oil and cook them for 1-2 minutes. 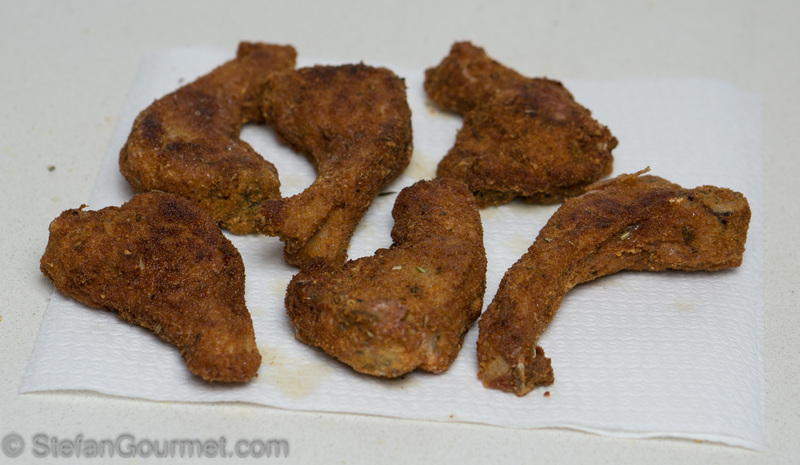 When they are golden brown, turn them over and cook the other side for 1-2 minutes as well. Do not overcook, as we want the lamb to be nice and pink on the inside. Allow any excess oil to drain on paper towels. Lamb is usually paired with white wine. Marina advises to drink Prosecco with this, which would be outstanding. We had it with a Verdicchio dei Castelli di Jesi Riserva, which was also an excellent choice. Two years ago I also blogged about Italian home cooking. In this case it was my attempt to recreate the meatballs that my Italian friend Fabio’s grandmother always used to cook for him. I lovr your blog and your recipes but .. why not in Italian too ?? Ah ok infatti non riuscivo a capire se fossi inglese o italiano . Grazie mille per tutte le ricette , sono gustosissime !!! Woow bello , ma di nascita , o perché ti sei trasferito li successivamente ?? Sono olandese e ci ho sempre abitato. Vado in Italia solo per vacanze. Ho imparato l’italiano perché mi piace andare in Italia, cucinare all’italiana e parlare con prodottori di vini e con la gente di ristoranti e trattorie. Oddio hahahah ma sei un prodigio .. lo parli benissimo , giuro che non avrei mai scommesso che tu non fossi almeno nato in Italia . Grande , veramente molto bravo !! 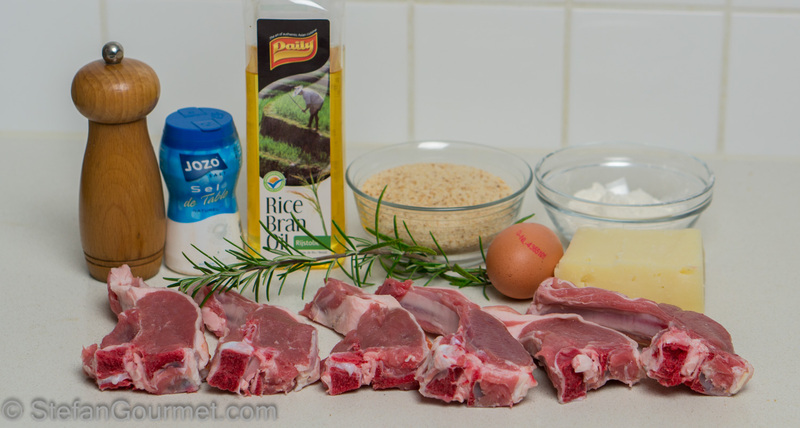 Great recipe for lamb chops, Stefan! Very nice. Very simple but totally dependent on good method.